How the time flies. It seems just yesterday that I was doing my first Mangala Gowri pooja and here today both my daughter and daughter-in-law are doing the pooja together. And the most important part of the Mangala Gowri pooja is making godhi hittu - wheat flour - tambittu. 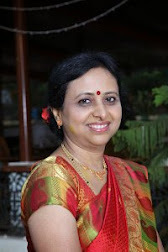 When I was doing pooja my co-sisters would do the tambittu and I had never dwelled deep into the recipe as I was busy performing pooja and running to the office. 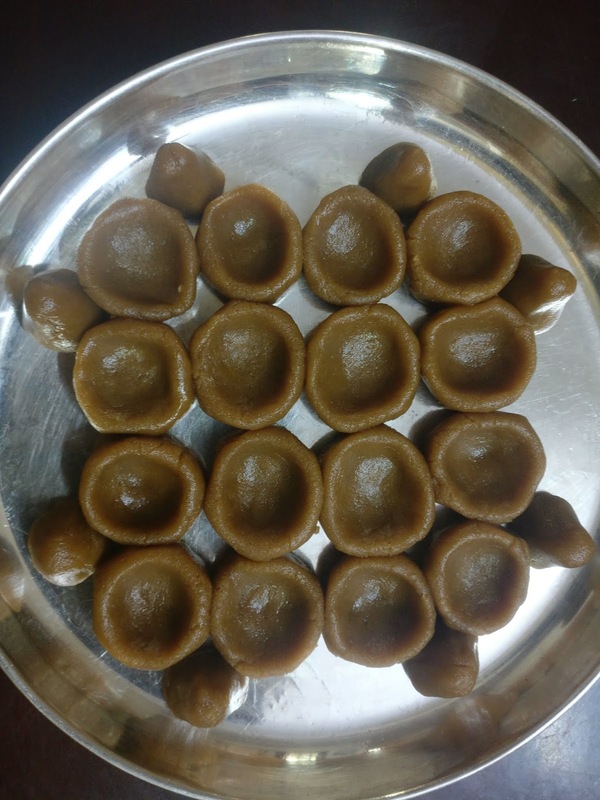 Today I sought help from my friend Padmaja, who is an expert in making soft holige - puran poli - bele obbattu, who gave me this quick and easy recipe. By the way you can check here the best recipe for making soft bele obbattu. Follow this recipe to the T and your obbattus would be a real treat. And here is the recipe for godhi tambittu. 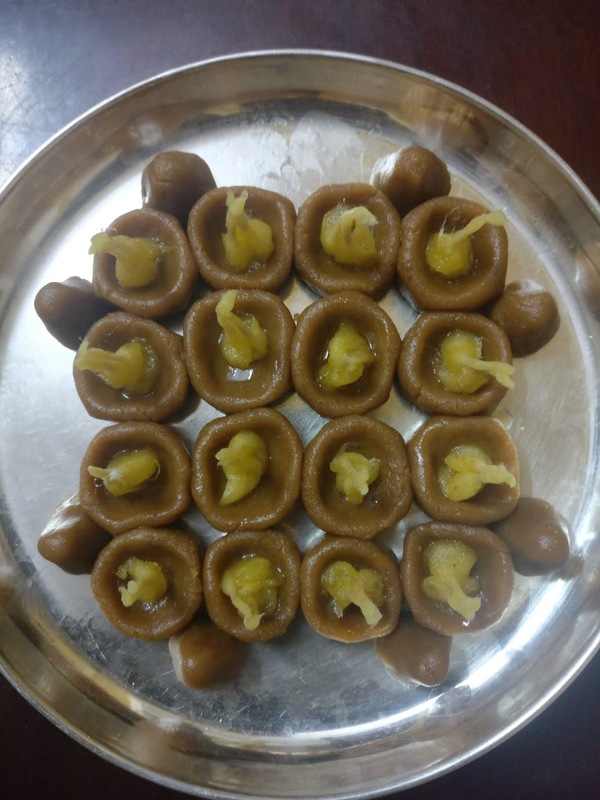 Ooops... Did I mention that these tambittu are so so yummy and delicious that you would have great difficulty in controlling yourself to stop gobbling one after another. If you want to distribute them as prasada, make sure to prepare more else nothing would be left when the guests arrive. And when the first guest starts eating, nothing would be left for the last guest! Or else train yourself into a great lesson of self control. In a thick bottomed kadai dry roast the atta till the raw smell goes and it starts giving a nice aroma. Then add ghee and fry for a minute or two. Shift the roasted flour to a plate. Now in the same kadai put bella - jaggery with 2 cups of water. Keep stirring till jaggery melts and it becomes antu paaka - sticky syrup - and switch off the gas. Don't leave for long else tambittu becomes hard. Then add the roasted flour and mix well. Within a few minutes it thickens into nice soft tambittu. Now prepare the tambittu deepas, gopura or unde. This tambittu is generally prepared for pooja diyas during mangala gowri and other festivals in Shravana. If you want to eat tambittu during non-festival season, you can add fried dry fruits, fried grated dry coconut and elaichi powder to enhance the taste.